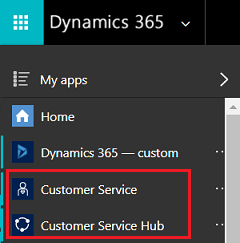 Welcome to Dynamics 365 for Customer Service. Build great customer relationships by focusing on optimum customer satisfaction with the Customer Service apps. Customer Service provides many features and tools that organizations can use to manage the services they provide to customers. The Customer Service Hub app is built on the Unified Interface framework, which uses responsive web design principles to provide an optimal viewing and interaction experience for any screen size, device, or orientation. Using Customer Service Hub on a desktop browser for tasks other than managing knowledge articles is not recommended. Easily set up the Customer Service Hub and the Customer Service app by using the Service Manager Guide. The Service Manager Guide helps you set up everything related to customer service, like defining parent-child case hierarchy, creating queues, routing rule sets, rules for automatic case creation, service level agreements (SLAs), entitlements, and customer service schedule. If you have previously installed any portal solution, to create a case in the Customer Service Hub or to use the Merge cases command, you must turn off the Read-only in mobile option for the Case entity. More information: Turn off Read-only in mobile option. Customer Service Hub is committed towards inclusive design and accessible content. The app is designed around accessibility so that all users can be effortlessly productive. For more details about the app's accessibility and GDPR compliance, see Accessibility and GDPR.